This volume presents the proceedings of the international interdisciplinary founding conference of the division “Documenta Antiqua” at the Institute for the Study of Ancient Culture of the Austrian Academy of Sciences (Vienna), held in 2014. The research focus of the new division are the source disciplines of ancient history: mainly epigraphy, numismatics and papyrology. The book contains an introductory essay as well as 17 contributions on various aspects of ancient infrastructure and on the flow of money, goods and services in ancient economies: in the classical and Hellenistic Greek world, the Roman Empire and in ancient Iran, from Neo-Assyrian times to the Parthian and Sasanian periods. In a general perspective, there is a special emphasis on numismatic contributions. So far, numismatics hardly played a part in modern research on the ancient infrastructure, although money and financial services are universally acknowledged to be indispensable elements of the infrastructure of modern societies. 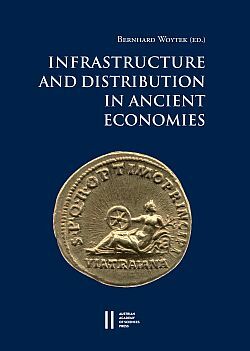 Hence, in this volume numismatics is fully integrated into research on the circulation of goods and the infrastructure of the ancient world for the very first time. Among the topics covered in these innovative contributions the following may be singled out: the economic implications of the extensive countermarking of Hellenistic silver coinages in Asia Minor; the importation and monetary use of blocks of foreign and obsolete bronze coins; patterns of coin production and coin distribution in the Roman Empire in the principate; structures of minting in ancient Iran in the Arsacid and Sasanian periods. oft in einem weiten Sinne verwendet, und zwar nicht nur in Bezug auf bauliche Strukturen wie Straßen, Häfen, Wasserleitungen oder Kanäle, sondern auch in Bezug auf institutionelle Konzepte, z. B. das Bildungssystem oder das Rechtssystem eines Staates ‒ oder auch sein Geld- und Finanzsystem. Vor allem der letztgenannte Aspekt wurde bisher in der althistorischen Forschung allerdings nicht entsprechend berücksichtigt. In vorliegendem Kongressband wird deshalb erstmals die Numismatik in die Erforschung der antiken Infrastruktur miteinbezogen ‒ auf numismatischen Beiträgen liegt dementsprechend ein Schwerpunkt des Bandes. Es handelt sich um eine Sammlung spezialisierter Fallstudien, die die Forschung zu infrastrukturellen Aspekten verschiedener antiker Wirtschaftsräume in eine neue Richtung lenken kann.